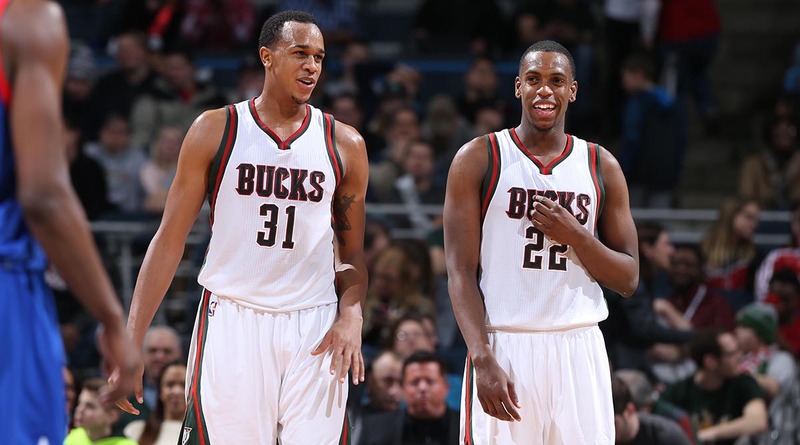 » Own the Future (and Maybe the Present): Are Milwaukee’s Young Bucks Already Ready? Own the Future (and Maybe the Present): Are Milwaukee’s Young Bucks Already Ready? On Sunday, it was a message that seemed to fit these Bucks. Despite giving the Bulls all they could stand in Games 2 and 3, Milwaukee was one game away from being a too-green team swept from the postseason by a fixture of the Eastern Conference playoffs. At that point, it probably was solace-finding time. Even four games and out was more than anyone could have hoped after cobbling together just 15 wins the year before. Giannis Antetokounmpo is still about seven months from his first legal Pabst Blue Ribbon. Khris Middleton has turned into a guy worth paying. In most other seasons, Jason Kidd probably would have been coach of the year. And they’ve done all of this without Jabari Parker since mid-December. Well, four days and two wins later, consolation may not be as important. Now, the Bucks are a home win away from crawling all the way back and dragging out this series as far as it can go. Even more than hope, what the Bucks have found under Kidd is identity. Milwaukee finished the season behind only the Warriors in defensive efficiency, and the terror they can instill on that end of the floor has been a fixture against the Bulls. Chicago turned the ball over a ludicrous 26 times in Game 4, and the Bulls’ backcourt followed that by going a combined 10-of-41 in Game 5. Much like Golden State, Milwaukee’s best defensive asset is its length, but when the Bucks are at their most dangerous, it’s because they’re deploying a defensive style all their own. The way Kidd has his team blitzing pick-and-rolls has created problems for Derrick Rose, who’s split only one or two of those double-teams the entire series. For the most part, Milwaukee is ruining the Bulls’ possessions before they even get started, and even if the Bulls do manage to find a numbers advantage thanks to Milwaukee being overzealous, the tangle of never-ending arms near the basket inevitably becomes a problem. Antetokounmpo blocked four shots in Game 5. John Henson altered a handful of others after blocking three in Game 4. Easy looks have been hard to come by for Chicago. When the Bulls haven’t been hitting from the outside — on looks they don’t normally make — their offense has been a slog. That end is where Milwaukee has its issues, too, and even though Kidd has clearly established a style for this team, the Bucks are still figuring out what their best lineups are when the game is in the balance. Michael Carter-Williams absolutely abused Rose on the block in Game 5, but for the most part, the Bucks have been best against Chicago with a lineup of Jerryd Bayless, either Khris Middleton or O.J. Mayo, Antetokounmpo, Jared Dudley, and Henson. Dudley was a serious problem whenever he was on the floor in Milwaukee,1 and his presence essentially forces Tom Thibodeau to go with Nikola Mirotic or Taj Gibson at the 4. In the locker room after their Game 4 win, Dudley called it a “veteran game,” with him, Mayo, and Bayless playing key roles off the bench. That’s where the Bucks are. Dudley, who’s 29, and the two guards, neither of whom is older than 27, are the elders on this team. When a reporter suggested Monday night that playing loose while having nothing to lose might have fueled the Bucks’ two wins, Kidd balked. With a team this young, he said, every game is an opportunity to learn. For him, it’s another chance to further figure out his team, and for his players, it’s a chance to get even more familiar with basketball at this level. There are varying opinions on the value of playing — and losing with — young players in the playoffs, but Dudley was adamant that it’s an important experience for players like Antetokounmpo and Carter-Williams. This is their first time having to process information and recognize tendencies while the game is moving at a different speed. It’s an entirely different way of playing. Every possession matters now, and that’s hard for younger players to understand until they actually see it happen. Near the end of last season, the Bradley Center was one of the sadder venues in sports. It was an empty 26-year-old building that often felt even older. The capacity is relatively small — just less than 19,000 — and the only luxury boxes are in a ring at the top of the lower bowl. It’s not at all surprising that the league is pushing for the Bucks to find a new home. If the stadium issue hits a snag and the franchise is eventually forced to relocate, Seattle looms as the most likely possibility, which would present a cruel irony. Antetokounmpo isn’t Kevin Durant and likely never will be, but to see a 20-year-old potential star leave town and put on a Sonics jersey would represent a bizarre sort of karmic justice. Antetokounmpo’s offense has drifted in and out of this series, but in Game 3 he flashed the clearest vision of the player we might eventually see game in and game out. He finished with 25 points on 10-of-22 shooting, including a few midrange jumpers that could be a potentially terrifying addition to his game. The number of steps it takes for him to get from end to end is mind-bogglingly low, and his ability to easily attack the rim was on full display for most of the game. Like the Bucks as a whole, it was an impressive showing that hasn’t quite fully developed. There were missed bunnies and careless choices. Still, the glimpses of promise were everywhere. That’s been true for most of the Bucks over the past five games. Henson, who’s still just 24, will soon be eligible for an extension, and he’s coming into his own in his fifth season. After adding a bit of range to his game this offseason, Middleton is guaranteed to turn down his qualifying offer this summer and get a pile of money from somebody. He is just one of the looming decisions that are actually a decent problem to have. What’s clear about the Bucks, from a personnel standpoint, is that new ownership has allowed them to play the long game. Trading away Brandon Knight, who the Bucks clearly thought would be out of their price range this summer, was a move that admittedly made Milwaukee worse in the short term. For a team that surprised a lot of people and was actually competitive when many didn’t think it would be, that kind of foresight is enviable. It might have been better off keeping the Lakers’ pick and rolling with a combination of Bayless and Tyler Ennis at the point, but overall, the move was a sign that the Bucks understand that one trip to the playoffs and a bit of optimism isn’t a plan. Henson is one of the few players remaining from the last time the Bucks made the playoffs, when the Heat quickly swept them away. He was 0-for-7 before the win in Game 4. But even if the Bulls had pulled that one out, this time around feels different. “It feels like we’re building something,” Henson says. “My rookie year when we went to the playoffs, I think we had eight free agents, nine free agents. You knew guys weren’t going to be here.” Save for Middleton, this group is set to stay intact for a while, and next year, that group will also include Parker. All series, Parker has been around, hanging out in street clothes, hunting for coconut shrimp in the postgame spread. He’s a walking reminder of what’s to come for this team. It’s not just that he’s the second overall pick and the exact sort of scorer the Bucks need. He fits their ethos — the length, the ability to maintain that identity they’ve built defensively. The Bucks are already a handful, but with apologies to Kidd, even if they do manage what no NBA team has ever done and knock off the Bulls after trailing 3-0, it’s hard to not think about what their future holds. Two early fouls meant we didn’t see much of him in Game 5. The final $50 million in funding to get the bonds released would come from “the city, county or from potential land swaps between governments, according to state and team officials,” according to the Milwaukee Journal Sentinel. Houston’s Supervillain: Should the Astros Activate the Death Star Ahead of Schedule?